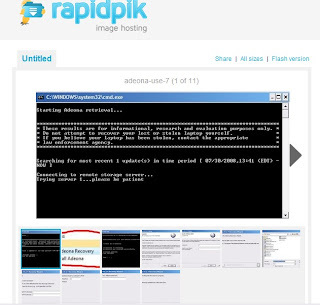 We can find a lot of image hosting sites online, most site are free without register, if you want use a picture on your blog that should be easier. 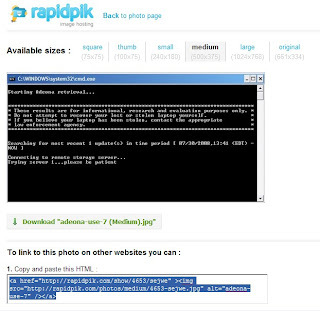 Rapidpik is a new image hosting site that allows you upload some pictures once time, and it also has some nice features. A good point is you can upload multiple pictures together, it is easy to press Shift key + mouse click to pick up pictures that you like uploaded. It is quick and convenient. Another nice point is it offers different sizes of picture links in one page, you can view all or individual picture. You can also use its flash player to play your pictures. Of course, you can embed pictures to your website, it gives you a code. 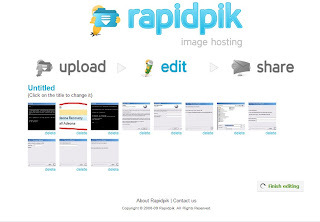 Rapidpik is nice image hosting site.